"Exult, let them exult, the hosts of heaven, exult, let Angel ministers of God exult, let the trumpet of salvation sound aloud our mighty King's triumph! Be glad, let earth be glad, as glory floods her, ablaze with light from her eternal King, let all corners of the earth be glad, knowing an end to gloom and darkness." The Easter Proclamation, or Exsultet, is the triumphant song of praise that proclaims "Christ is Risen!" during the Easter Vigil in the Roman Rite. 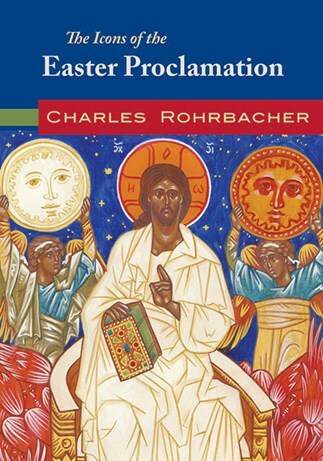 Acclaimed iconographer Charles Rohrbacher has illustrated a one-of-a-kind ritual book: The Easter Proclamation (Exsultet). This CD presents the vivid, scripturally grounded images of his unique work for projection in the sanctuary and use in prayer. The icons of The Easter Proclamation draw on the vivid and poetic texts of the ancient hymn. They depict Holy Mother Church, Moses leading the Israelites through the Red Sea, the expulsion of Adam and Eve from the Garden, Christ the Morning Star and other images from the great story of salvation as proclaimed in this sacred moment. Charles Rohrbacher reverently depicts each of these scenes using classical iconography techniques. Each unique picture draws on the long tradition of Christian icon writing. Charles Rohrbacher has been an icon writer for more than twenty years. He has studied with Orthodox iconographer Dmitri Shkolnik in San Francisco and New York, and with Byzantine Catholic iconographer and Jesuit Father Egon Sendler of the Centre d'Etudes Russes in Paris. Rohrbacher is the former director of religious education and is currently deacon for the Cathedral of the Nativity of Mary, Juneau, Alaska.